If we fail to educate little children, if we fail to put books in their hands, then we fail to create a foundation for them to rise out of poverty and oppression. What will there be to build on? We were a core group of 8, most of us artists or writers, 6 from the US and 2 from Ethiopia. Just over a month ago, we traveled together from Addis to Maji, a small, rural area about 350 miles southwest of the Ethiopian capital, then back to Addis. We were part of an Ethiopian Odyssey, one goal of which was to create colorful, culturally appropriate books for young children in Ethiopia. While we were traveling to and from Maji, and during our week there, all of us were writing, sketching, drawing, taking photos, and reflecting on what and who we saw. Ethiopia Reads has been a trailblazer in raising awareness about literacy and libraries for children. Long time Ethiopia Reads leader and prolific author Jane Kurtz, a pivotal Odyssey crew members, spoke at a well-attended public lecture in Addis about the tremendous need for colorful, culturally appropriate books for pre-readers, the toddlers and little kids who can (must) engage with books that start them on the path to reading. The books for these early readers are scarce in Ethiopia, and we are hoping to change that. On Saturday February 6, we had an amazing book-making event. Children from the International Community School in Addis attended; they were Ethiopian, Canadian, American, Indian, Chinese, and more. Ethiopian children who are part of one of Ethiopia Reads’ Addis libraries also came for the “field trip” by bus. Some had lots of experience with art; some had none at all. Our goal was to talk with the kids: How do we write stories? And then: Let’s make illustrations! We worked with a Ethiopian proverbs, including “Turina keessatt killen millaan adeemti. By persevering, the egg walks on legs.” The kids did all kinds of drawings as they figured out how to tell stories. I worked with dozens of children using tissue paper collage. They used their imaginations and their life experiences to make rockets, flowers, spiders, butterflies, mountains, trees, and more. Now our task is to take the stories and art of these young people and create books that will be in (we hope) at least two languages, English and Amharic, but also in many of the other languages spoken and read in Ethiopia. We will put the books in the libraries of Ethiopia Reads, and (we hope) in other sites as well. It’s a big, costly project. My fellow travelers on the Ethiopian Odyssey are up for the challenge. The art created and donated by Stephanie Schlatter, Troy Zaushny, Yacob Bizuneh, and Nahosenay Negussie as a result of our time in Maji and on the road will be exhibited and sold this fall. I will post more info about the exhibitions as we nail down dates and venues. On one level, this was a life-changing adventure by artists to create books by children for children in Ethiopia. On another level, it’s a way to create hope. It is, maybe, a way to build a world that is based in literacy and beauty. Small steps, I know. Still. In just a few weeks, I will be heading to Ethiopia. It will be my fourth trip, my second with some folks from Ethiopia Reads plus some new friends, Ethiopian and American, all of whom are artists and writers. Creating art and photographs that we will transform into books for Ethiopian children. The books will be fun and colorful; they will also be culturally appropriate and respectful. They will be translated into local languages for Ethiopia Reads’ schools and libraries. Books are a big deal. Books for children in the local language spoken by the children are rare; I am thrilled to be a part of making them more common, and getting them into the hands of children who have no books. Traveling some 500 miles south of Addis Ababa to Maji, a beautiful, remote area with no electricity. Yes, indeed. We writers, artists, and photographers will spend a week in Maji taking pictures, drawing, painting, and listening to the stories of the people there. I and others will be donating our photos and paintings for several 2016 exhibits across the US, to raise funds for Ethiopia Reads’ libraries in southwest Ethiopia. Preserving the stories of marginalized, vulnerable people. In Maji, we will be talking with and listening to people who live without electricity, who are working to hold on to a language that could disappear, and whose stories will become part of books and other materials for the children. I am also planning to continue a project dear to my heart: collecting, preserving, and sharing the stories of Ethiopian first mothers, those who gave their children up for adoption. Theirs are among the most silent and silenced voices in the adoption community, and their stories deserve to be told. I look forward to visiting with dear friends in Ethiopia, and once again enjoying the vibrancy and beauty of the country. There is great upheaval there as well: economic, environmental, and political. I am not ignoring that reality. Children and women are often among those who suffer most in times of strife. Literacy (including books in local languages) can make a difference. So can electricity, and, I’d argue, art. For more information about this adventure, please take a look at Ethiopian Odyssey. We all struggle at times with “crossing,” the movement from one place to another, from what we know to what we don’t, from displacement of bodies, minds, and hearts. Sometimes, crossing means moving from life to death. Sometimes, it means traveling far from “home,” however we define it. Sometimes, memories cross our minds. Last night I attended the Artist Reception for a show called Crossing: East African Artists and Social Change, held at the M. Rosetta Hunter Gallery at Seattle Central Community College. All three artists had roots in and work focused on Ethiopia and/or Eritrea. Their individual pieces of art also provided broader views around longing, loss, searching, and migrating, both literally and metaphorically. Each artist had a theme of “crossing” in the art. Each spoke briefly about his/her work. It was wonderful. Selam Bekele’s art included photography, collage, mixed media, and a short film. She referred to her art as “Tizita,” an Amharic word which has the sense of memory, or longing, or nostalgia in English. Having written about the fascinating, poignant story of Prince Alemayehu: The First Ethiopian Adoptee?, I looked forward to seeing Selam’s film “The Prince of Nowhere” at last night’s reception. It was a dynamic, evocative film. In 1868, Alemayehu arrived at age 7 in England, far from his homeland of Ethiopia. The film, an exercise in crossing time and space, shows him as a handsome young man (he died at 18 years of age in 1879), in contemporary western clothing, on modern streets, in a modern classroom. His voice in the film has a British accent. Sometimes the images are blurred, and the light distorted, all reflecting Alemayehu’s life in an exile about which he had no voice. The brief film, like Alemayehu’s brief life, is poetic and sorrowful, a story of resilience and despair. My friend Yadesa Bojia had several powerful pieces of art at the gallery, most with bright colors and passionate exhortation for the power of literacy and family. 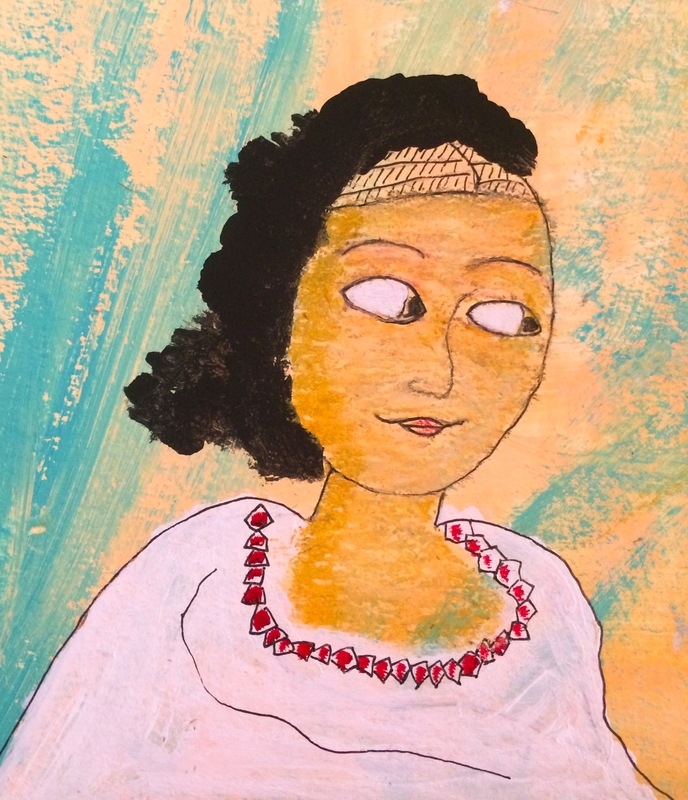 A brand new piece, exhibited for the first time, was titled “Hanna,” a heartfelt tribute to Hanna Alemu, also known as Hanna Williams. Hanna was an Ethiopian girl adopted in 2008 by a family in Sedro-Woolley, Washington. She died in May 2011, and her adoptive parents were found guilty of homicide by abuse in September 2013. Hanna died from malnutrition and hypothermia, according to the coroner, alone outside her home on a 40 degree night. 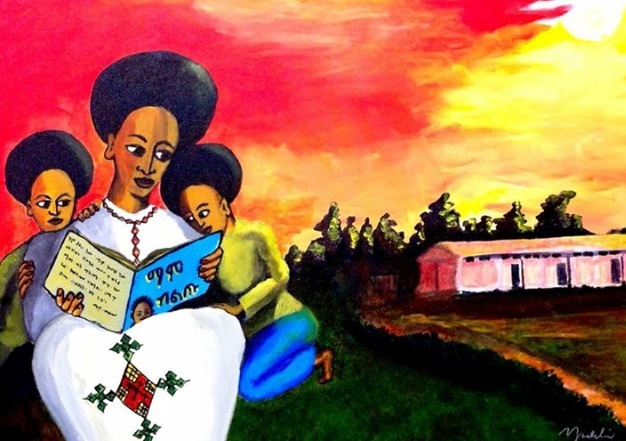 The painting has Ethiopia’s traditional colors of red, yellow, and green, with the image of Hanna in black outside behind the family home, beneath a stark bare tree branch. It’s wrenching to see in simplicity and vibrancy. I’ve written extensively about Hanna, and attended nearly all of the trial in the summer of 2013. Ethiopians all around in Yaddi, who is the designer of the current African Union flag, is also a singer and songwriter, and wrote about Hanna. His album information is available here. The third East African artist was Yegizaw “Yeggy” Michael. His work included vibrant acrylic paintings about crossing the desert, and crossing the sea, from the perspective of migration and loss. He also had an amazing installation piece that depicted the tragedies of immigrants from the Middle East and North Africa attempting to cross the Mediterranean Sea. Some 3,000 people in 2014 are estimated to have drowned trying to cross the Mediterranean en route to Europe, according to this report. Yeggy’s art, about 8 feet long on the floor, had rocks and sand around a blue plastic sheet that held blue scarves and blue face masks. There was one black scarf, with peace symbols. Yeggy talked about how the journey these immigrants has an echo in the slave ships of the African slave trade, and how these “crossings” are terrifying and heartbreaking. We all make crossings, he noted. Some of us do not succeed. The art will be on display at the Hunter Gallery in Seattle until February 13. You can read my post about it, “Adoption Stories In the Light of Day, Through Art and Hopes for Healing,” here. 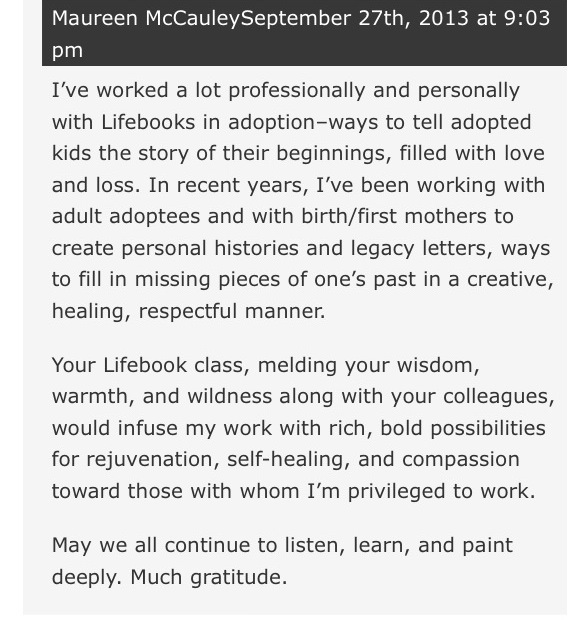 The Life Book 2014 class started January 1. It’s intense, challenging, nurturing, and fun. There are hundreds of people (mostly women) participating from around the globe. There are videos, pdfs, inspirational quotes, meditations, manifestoes, and faqs: thoughtful information that is clear and attentive. The wonder of the Internet allows folks to post their work in various forums, both globally and locally focused Facebook groups (examples: Australia, US Midwest, Holland, the Pacific Northwest, which includes people from Washington, Oregon, and British Columbia). 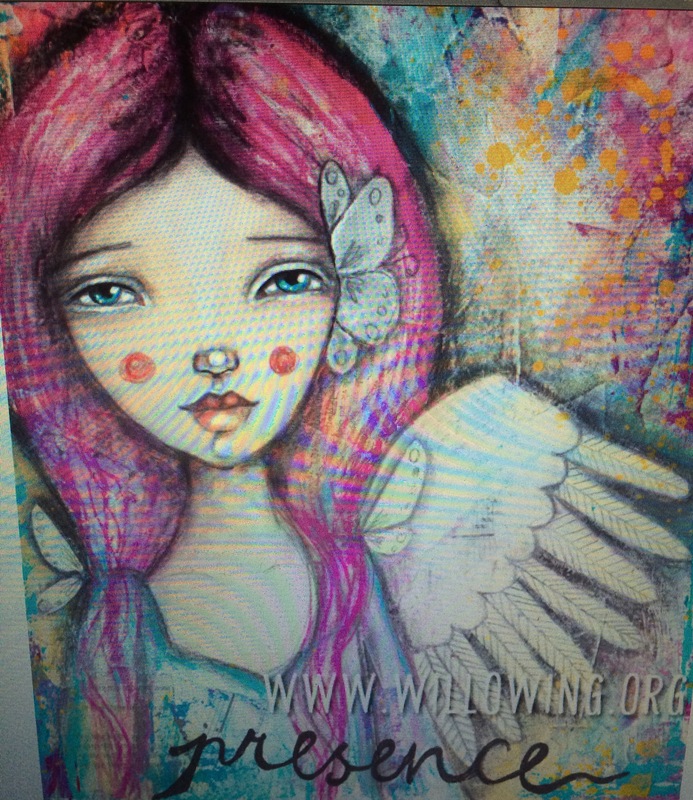 The astonishing creative force behind this is Tamara Laporte, of Willowing. She’s a British artist, whose work is full of color, whimsy, fantasy, warmth, and vibrancy. Her web site offers all sorts of classes, workshops, and ideas. She is exuberant in her sharing. She emphasizes self-care, by encouraging participants to stop listening to negative voices and to put themselves fully into the joy of the creation of art. Her video lessons are thoughtful in their detail and encouragement. She mentions simply in passing the rheumatoid arthritis that affects her fingers, which to me reveals a matter-of-fact and enormous courage. It is a reminder that we rarely know what effort (pain, struggle, discomfort) exists quietly behind the lives of people who are doing amazing things. They don’t deny or publicize the pain or the struggle–they let it accompany them on their journey, and keep moving, creating, and achieving. While viewing the video lesson, my thoughts slipped to ideas of guardian angels, to the presence and power of guardians, and to various women I have known here on earth who have brought me inspiration and hope. I also thought about the role of angels in Ethiopian traditional religious art, though they also appear in contemporary Ethiopian art as well. The Walters Art Museum in Baltimore had an exhibit at the Museum of Biblical Art in New York City titled Angels of Light: Ethiopian Art. Here’s an excerpt from the description: By the fifteenth century, (Ethiopia) had developed a tradition of icon-painting that rivaled the Orthodox empires of Byzantium and Russia, as well as the famed panel paintings of Renaissance Italy. There is so much people don’t realize about Ethiopia. See the word “Presence” on Tamera’s painting above? We are, in this class, to choose a word to focus on in 2014. I chose “Gratitude.” I hope to be more aware and present, and to express gratitude more to other people, by saying thank you, and by acknowledging others’ kindnesses, efforts, accomplishments large and small. Original artwork by Maureen McCauley Evans. May I cherish what is offered in good faith by others. May I embrace gratitude. May we see strength in ourselves and others. May the generous hearts of so many people not be overlooked. Sometimes we American adoptive parents can forget the feelings of our children’s fellow citizens about the loss of their children. I’ve known many Ethiopians who are grateful to be in the United States, because there are truly far more economic and educational options here for them. I know many Ethiopians here in the US who are working hard to bring their relatives to the US, and who send money back to their families in Ethiopia, hoping to help them in small and large ways. I’ve had many Ethiopians express gratitude to me for adopting my girls. And I believe that when Ethiopians express gratitude to me for having adopted two girls, their thanks are tinged with wistfulness and sorrow that the girls had to lose their culture, their family, their language, their heritage, their people to be here. The trial of Larry and Carri Williams in Washington state captured attention around the world, as people shared sorrow and outrage, hearing what happened to young Hana Alemu, an Ethiopian adoptee, and to Immanuel, both of whom were adopted by the Williamses. The Williamses were convicted on August of homicide by abuse, manslaughter, and first degree assault of a child; their sentencing is now scheduled for October 29. As an adoptive parent of Ethiopian twin daughters, my heart ached for Hana and Immanuel. In the course of watching the trial unfold, I shared a number of conversations with adult international adoptees, as we sought to understand, grieve, and listen together. I also talked often with members of the Ethiopian community in Seattle and in Skagit County. Their grief was especially poignant. In some ways, there is no understanding what happened in the Williams family. It is a tragedy for everyone involved. And it may seem simplistic or fatuous to suggest that any good can come from this harrowing case. Yet I believe that good is indeed possible. I wrote about Hana’s Legacy here, and that gives some ideas for change and hope. I have had a long-standing connection with the beautiful, complex, ancient country of Ethiopia for nearly 2 decades, as a result of adoption. I’ve long been interested in literacy and I love libraries, so my connection with Ethiopia Reads makes sense. Ethiopia Reads promotes literacy in Ethiopia, provides books in local languages, and has planted libraries in every region of that large country. I’ve been on the Ethiopia Reads Board, I’ve visited the Awassa Reading Center and other libraries, and I remain committed to the idea that with literacy can come empowerment and possibilities, especially for children, especially for girls. Two talented Ethiopian artists, both of whom now live in the Seattle area, have also been wonderful, powerful friends of Ethiopia Reads. Both have also, like so many members of the Ethiopian community in Washington state and around the globe, grieved for Hana and Immanuel. Yadesa Bojia is an amazing artist and musician. Please take time to learn about him here. Sultan Mohamed is also an accomplished artist. You can read more about him here. Both of these men have supported the work of Ethiopia Reads (and other important Ethiopian causes), through their time, their good hearts, and their incredible art. To me, the painting shows the fire, the power, the light that can be created through reading. It’s a shared joy and gift between mother and child. It’s the mother’s knowledge of what reading and education can mean for her children, who have so much potential, given the opportunities. 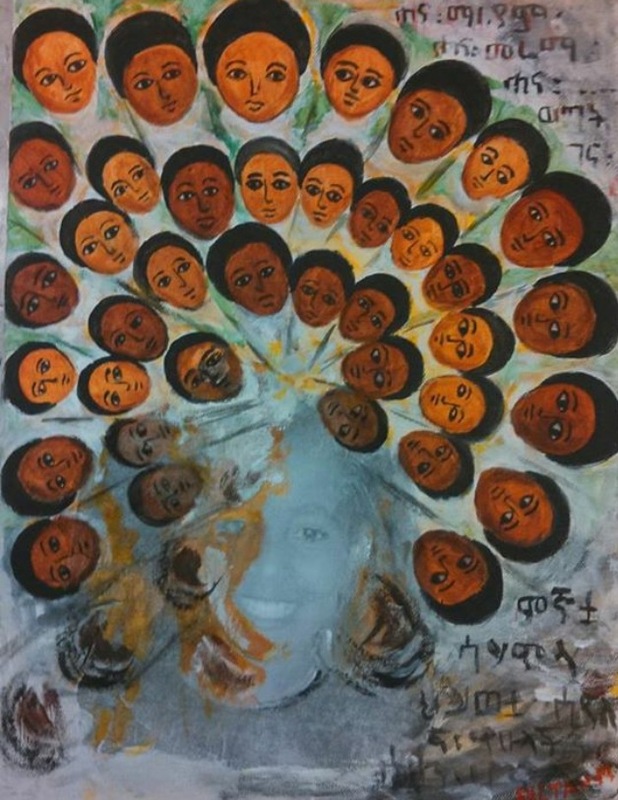 Note the photo of Hana, surrounded by Ethiopian faces, perhaps angels, but certainly reminding us she is neither alone nor forgotten. Amharic writing engulfs her as well, ensuring us that she remains connected with her roots, her language, the sounds and words of those who loved her in Ethiopia and beyond. These talented artists, these good men, have donated their paintings to an upcoming event (December 14, in Seattle, information provided below) to raise funds for Ethiopia Reads. I am in awe of their generous hearts, and of their deep commitment to children whose lives can change through literacy. It may seem paradoxical that adoptive parents should work to ensure that fewer children need to be adopted, but it’s true. May we continue to move toward a world where all children can read, and thus be empowered in this world. May all children have safe, loving families, who can keep them and provide for them all that they dream of. Information about Ethiopia Reads and the December event is available here. If you are looking for a small, effective organization that has opened libraries across Ethiopia where there were none, that has trained and employed Ethiopian teachers and librarians to sustain the libraries, that has worked with the local community in a respectful, transparent way, please look into Ethiopia Reads.